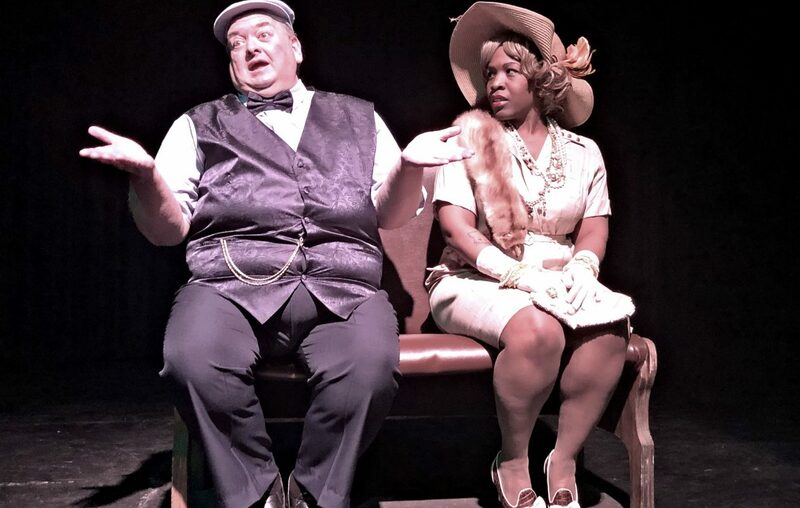 A series of short plays, “Buffalo Quickies,” is back again this year at Alleyway Theatre. Pictured are Michael Starzynski and Shawnell Tillery. The Buffalo Quickies are the Alleyway Theatre’s annual lineup of short plays. 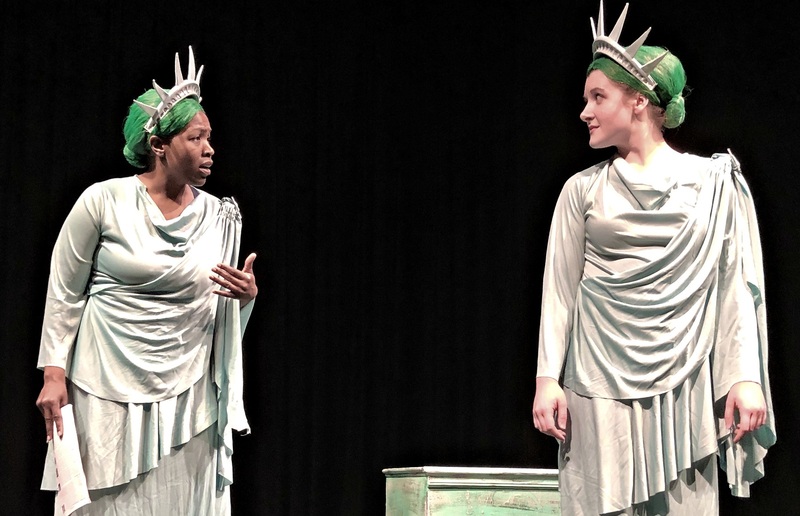 Now in its 28th year, this year’s roster features eight plays, all by local playwrights, most of whom attended the opening, giving the event a happy buzz. The personality of the annual Quickies is defined as much by the ensemble of actors as by the plays. This year’s quick and able crew includes Stephanie Bax, making a sixth appearance in the festival; Dylan Brozyna; Jaimee Harmon; Mike Starzynski, appearing for the 13th time; Shawnell Tillery; and Andrew Zuccari. These actors gamely dive into the material, entering as new characters whenever needed, and shifting the scenery between plays. The evening opens with veterans Starzynski and Bax in “One Man Show,” by Mike Randall. Starzynski plays an actor portraying Aaron Burr in a solo performance. He’s barely gotten started when a heckler, played by Bax, begins to taunt him from the audience. She turns out to be an old and reliably unsupportive friend. It’s an entertaining conceit. It’s also somewhat traditional to begin (and sometimes to end) the Quickies with something meta-theatrical. Starzynski and Bax easily land the comedy and get us off to an amusing start, under the direction of Samantha Marchant. Shawnell Tillery, left, and Jaimee Harmon star in one of the Buffalo Quickies one-act plays. Most of the evening’s plays have been directed by Joyce Stilson. Carly Weiser has directed two. Samantha Marchant and Stephanie Riso have each directed one. They have given the event an even tone and pace. It is not unusual, even for short plays, to run through their clever setups before they’ve run their brief length. That happens several times during this installment of the Quickies. Not all of the shifting furniture between plays is handled with equal ease and efficiency, either. In the main, however, the evening is brisk and amusing. For many, the obvious highlight of the evening will be “A Work Break Downtown,” by Jeff Z. Klein. The play is set atop the Liberty Building in downtown Buffalo. Here, for nearly 100 years, twin statues of Liberty, one facing east, the other facing west, have symbolized the greatness of our city. The image was instantly recognizable to the audience, who began to vocalize approval even before the lights had come up after intermission. Klein brings these statues to life as they discuss the current Buffalo Renaissance. The catch? One statue is white and faces downtown, the waterfront, and Canada. The other is African American and faces the East Side. Tillery plays “East Facing Woman,” and Harmon plays “West Facing Woman.” Stephanie Riso directs. Jennifer Tromble’s “The Arrangement” offers us Noel Coward’s “Private Lives” as seen through the eyes of Sam Shepard. Two couples get together for breakfast. We soon realize that an ex-husband is meeting his ex-wife’s new boyfriend for the first time. Mark C. Lloyd’s play, “Over the Tears,” is a comedy on the surface, but with a powerfully emotional undertone. A man in a café is sitting alone, when the personification of “Love” stops by his table. It is the evening’s most soulful play. The title of Justin Karcher’s, “Who’s Afraid of Donald Trump?” might echo Edward Albee, but the content reminds us of John Patrick Shanley’s “Psychopathia Sexualis,” about a man who uses his father’s socks to work through his personal problems. Karcher’s innovation is that Daddy’s sock becomes a sock puppet that speaks with the dead man’s disapproving voice. Zuccari and Bax play the George and Martha – I mean, Mike and Liz -- in this playful tale about the voice of authority. Marchant’s “Starting Out Strong” depicts strangers who meet on a park bench. Barry, played by Starzynski, comes on to Matilda, played by Tillery, rather too strongly. It’s a quick piece, which ends the first half with a smile. Bella Poynton’s “Eleven Things That Almost Happened to Rick and Hannah … and One Thing That Actually Did” takes a man and a woman through a fast succession of interactions in which she is striving for order and stability, and he is a loose cannon. Each time the lights come up, she finds she is in a new setting. He’s lost his phone, for the fifth, sixth, or seventh time. They’re in a coffee shop. They’re on a trail. This is dramatically, the most sophisticated of the evening’s plays. Bax and Brozyna play the roles under the direction of Stilson. The final play of the evening, “The Credible Adventures of Pylon and Thunderthighs” by j. Snodgrass, is a playful sketch about two misfits who meet through Craigslist and embark on a life as art thieves, dressed as superheroes. Directed by Weiser, it ends the evening with a chuckle. Costumes and wigs by James Cichocki are excellent. Runs through May 4 at 7:30 p.m. Thursdays through Saturdays at One Curtain Up Alley. General admission is $32, while students get in for $16. Find ticket info at Alleyway.com.